Dangers to your eyes in the workplace are not only limited to physical objects but also include UVA and UVB Rays in which long term exposure can cause permanent eye damage. Pyramex has invested heavily in the technology behind their safety range to ensure they offer the highest level of protection available in the market. All Pyramex (AS/NZS 1337) lenses are made from high grade UV400 polycarbonate, providing 100% protection against harmful UVA and UVB rays. UV Ultra Violet rays from the sun can damage your eyes by contributing to cataracts, macular degeneration and growths on the eye including cancer. UVB rays are the main concern for your eyes. Accordingto the American Academy of Ophthalmology, Long term exposure to UV radiation in sunlight is linked to eye disease. UVB radiation is considered more dangerous to eyes and skin than UVA radiation. UVA rays are the primary ones absorbed by your eyes. While they pose far less concern than UVB, doctors still recommend that they be avoided. UVC rays are not a concern, as they are blocked by the atmosphere. VLT Visible Light Transmission describes the amount of light that reaches your eyes through the lenses. Measured as a percentage, VLT is affected by the colour and thickness of your lenses, the material they're made of and the coatings that they have on them. Due to the soft characteristics of polycarbonate, anti-scratch coatings are necessary to prevent scratches and provide resistance to abrasions. Anti-scratch coatings do not affect the optical characteristics of the lens. Anti-fog coatings are permanent and offer additional scratch resistance. This treatment also provides anti-static protection. Pyramex's H2X anti-fog technology blocks out fog, mist, sweat and steam. With H2X, vision will remain optically clear in any weather element. H2X anti-fog, anti-scratch coating is bonded to the lenses, and will continue to be effective even after repeated cleanings. 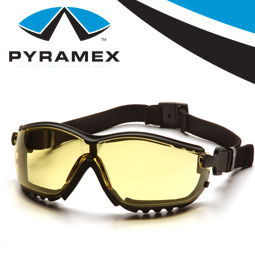 H2X technology is available in select models of Pyramex eyewear. CLEAR -General purposes for indoor applications that require impact protection. GREY- Commonly used in outdoor applications. Offers protection from excessive glare. AMBER- Commonly used in indoor, low light applications.Enhances contrast. INDOOR / OUTDOOR MIRROR - Coated with a light gold mirror finish to reduce glare. Commonly used where it is required to move between indoor applications to outdoor applications. SILVER MIRROR- Grey polycarbonate lens with silver mirror coating. Commonly used in outdoor applications. Reduces glare. SKY RED MIRROR - Grey polycarbonate lens with a double layer of silver and red mirror coatings. Commonly used in outdoor applications. ICE BLUE MIRROR- Grey polycarbonate lens with a double layer of silver and blue mirror coatings. Commonly used in outdoor applications. 3.0 IR FILTER- Commonly used around welding sites or for light brazing or cutting. 5.0 IR FILTER- Commonly used around welding sites or for medium to heavy cutting and medium to heavy gas welding.